The best part of waking up hasn't been Folgers for a decade or more. With Starbucks making gourmet coffee ubiquitous and boutique coffee roasters brewing ever-more-delightful java, Folgers is stuck in grandpa's mug. My brother-in-law and I give each other grimaces behind my dad's back when we drink the home brew at his house, and I've been known to bring my own beans when I'm visiting. But grandpa is getting on now, and consumers looking for ways to save cash turn to their daily coffee beverage so often that saving $4 a day has a name: The Starbucks Factor, or the Latte Factor, depending on your brand loyalty (or lack thereof). 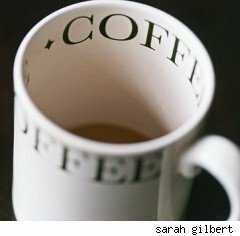 But Folgers, Maxwell House and the even lesser-known competitors make their coffee from the ultra-cheap and inferior "Robusta" beans, in contrast to the "Arabica" beans used by upscale coffees. Robusta beans thrive at lower altitudes and produce far more beans per plant, and have twice the caffeine of Arabica beans; but their flavor, according to coffee connoisseurs, is extremely inadequate. How could a discriminating coffee drinker be persuaded to switch to Folgers, without creating a price disadvantage? Instead of investing in better beans, Folgers invested in technology and marketing. Procter & Gamble has created a new step to the roasting process called "pre-dry" or "pre-roast", essentially similar to a slow-cooking process. Instead of roasting the bean over high heat while it's still green and tender, the bean will be dried through and, hopefully, end up with a less bitter or burnt taste. The key will, of course, be convincing consumers that Folgers is for young, hip coffee lovers and not just those who grew up on diner coffee (best served hot so your taste buds are numbed). The new marketing campaign emphasizes the "enhanced" nature of the coffee with these sensorially-stimulating ads. Is the image of the tired working dad enough to convince a new generation of grandpas-to-be to switch? What do you think?